Perhaps, I spent my most memorable moment at Swain’s when I turned ten, long before I became an employee. Every year we Stanfields made homemade root beer with Old Fashioned Root Beer Soda Mix (gotten at Swain’s, of course-at least in the sixties). We kids picked discarded beer bottles out of garbage cans, and bought new bottle caps because, of course, Birdie Stanfield the Self Sufficient One owned a bottle capper. While we mixed the root beer, that fragrance of warm, fruity brown liquid filled the house and reminded me of gentle ice cream pillows in an icy mug piled deep with sweet, latte-colored root beer foam. All I wanted to do was jump into a root beer float and do the backstroke. Mom said we had to let the root beer ripen for a few weeks which, to a little kid felt like a few years. With great reluctance, we capped the beautiful, drinkable nectar into bottles and set them in a dark pantry on the back porch beneath the watchful eye of a dim light bulb for a very long time. We had plans for that root beer. When it finally reached its full bloom of flavor, we each grabbed a bottle, snapped off the bottle caps, and set out for Swain’s. And bragging rights. Oh, the looks we received. We were too cool, parading through the scenic hills and valleys, the aisles of Swain’s, taking deep swigs of root beer from umber beer bottles, checking out rows of Can’t Bust ‘Em jeans, steel-toed boots, and Welch Leather Loop suspenders. Concerned shoppers stopped to stare, looked away, walked again, stopped and turned back with incredulous eyes pulled to the irresistible magnetism of a double take. We took the evaluation process we could see taking places in their eyes as our cue to leave, so we bought popcorn from a cashier too busy to notice our bottles, and finally burst out of that store with our now empty beer bottles. My brothers and I inhaled deep breaths of pristine air, laughed our heads off. I felt older, smarter; the fine edges of my newfound cockiness blurred ever so slightly by the ittiest aftereffect of guilt. 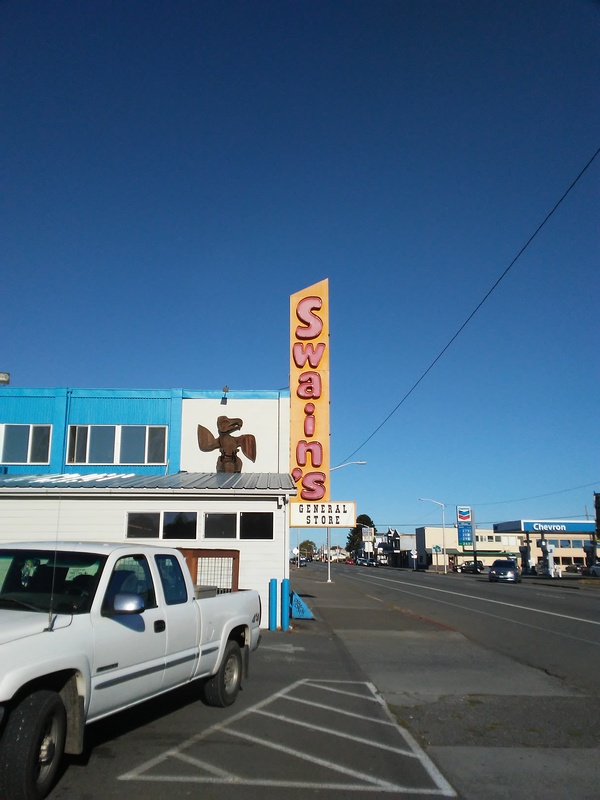 Ah, Swain’s, as much a part of a Peninsula childhood as log booms, mountain lakes, fishing, and a River called Elwha the color of cat’s eyes rushing to an icy Salish Sea. Have you been to Swain’s? You can see Sasquatch paraphernalia on an end cap, a great selection of camping gear, and some seriously tough clothing built for such a place as this glorious and sometimes punishing Peninsula. Oh, and you might want to try the popcorn, which you will find situated at the front, close to the cash registers.